The four-stage PSLV-C45 blasted off from the second launch pad at the spaceport of Sriharikota, about 125 kms from Chennai, at 9.27 AM Monday. Chennai: India’s EMISAT satellite along with 28 nano satellites of global customers blasted off from the Sriharikota, about 125 km from the city on Monday at 9:27AM. 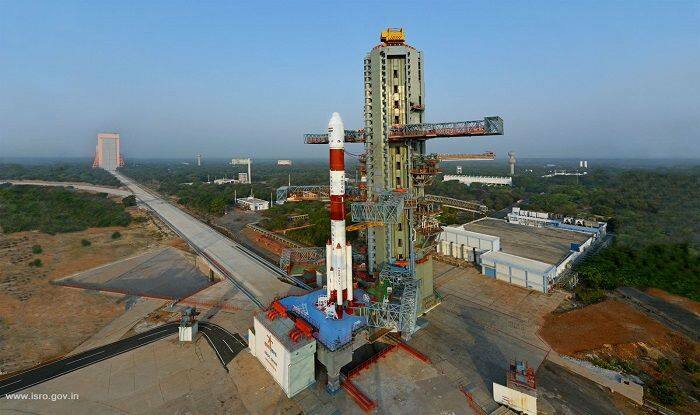 The countdown began at 6.27 AM for the launch on board Indian Space Research Organisation’s (ISRO) third generation workhorse Polar Satellite Launch Vehicle (PSLV), in its 47th flight. The four-stage PSLV-C45 blasted off from the second launch pad at the spaceport of Sriharikota, about 125 kms from Chennai, at 9.27 AM Monday. The 28 international satellites are – 25 3U type, two 6U type and one 2U type nano satellites – are from Lithuania (2), Spain (1), Switzerland (1) and the United States (24). Through this mission, the ISRO placed payloads in three orbits and conducted space experiments for the first time. The mission marks several firsts to the credit of the space agency as it would manoeuvre satellites in various orbits and orbital experiments including on maritime satellite applications. According to ISRO, a new variant of the rocket PSLV-QL equipped with four Strap-On motors in the first stage was used for the launch. PSLV, also used in India’s two key missions — “Chandrayan” in 2008 and Mars Orbiter in 2013, is a reliable and versatile launch vehicle for ISRO with 39 consecutive successful flights till June, 2017 and five-in-a row from January 2018. The rocket has encountered only two failures so far — its maiden developmental flight ended unsuccessful way back in 1993. In September, 2017 the flight went off without any hitch but the IRNSS-1H Satellite could not be released into orbit after the PSLV-C39’s heat shield failed to open on reaching the orbit. In Monday’s mission, ISRO scientists placed the satellites and payloads in three different orbits, a first for the agency. After injecting the 436 kg primary satellite EMISAT, intended for electromagnetic spectrum measurement, at around 17 minutes from lift off in a 749 km orbit, they restarted the fourth stage again. During this initiative, all the other 28 customer satellites, totally weighing about 220 kgs, were released by lowering the fourth state to around 504 kms orbit. Again, the fourth stage was reignited and further lowered to 485 kms orbit to serve as an orbital platform for carrying out spaceborne experimentations for the first time in ISRO’s history. According to ISRO, this is the first time it has been envisaged to provide a micro-gravity environment for research organisations and academic institutes to perform experiments. They are automatic identification system from ISRO for Maritime satellite applications capturing messages transmitted from ships. Advanced Retarding Potential Analyzer for lonospheric Studies (ARIS) from Indian Institute of Space Science and Technology (IIST) for the structural and composition studies of the ionosphere. All these satellites were launched under commercial arrangements, ISRO said. The previous launches by ISRO this year include the imaging satellite Microsat-R for military purpose along with 1.2 kg Kalamsat in January onboard PSLV-C44. In February, ISRO launched India’s communication satellite GSAT-31 from the European launch service provider Ariane from French Guiana.